What is CPAP Therapy for OSA? Continuous positive airway pressure therapy (CPAP) uses a machine to help a person who has Obstructive Sleep Apnea (OSA) breathe more easily during sleep. A CPAP machine increases air pressure in your throat so that your airway doesn’t collapse when you breathe in. 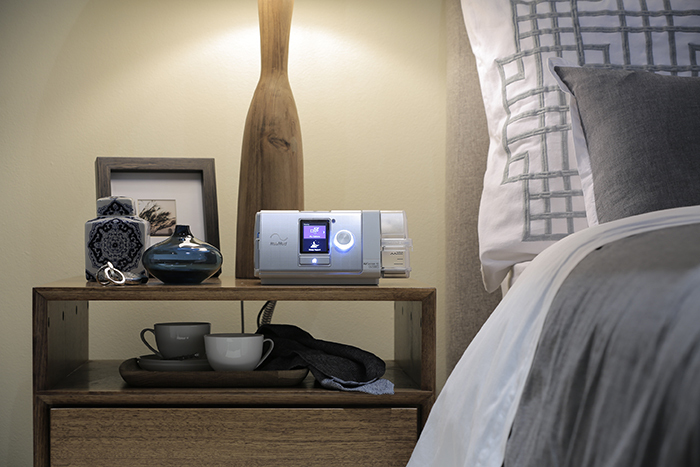 When you use CPAP, your bed partner may sleep better too. You use CPAP at home every night while you sleep. It may take time for you to become comfortable with using CPAP. If you can’t get used to it, talk to your doctor. You might be able to try another type of mask or make other adjustments. Referral: A Representative will schedule a consultation for you with one of our Registered Respiratory Therapists (RRT) within 48 hours of referral. Consultation: You and your RRT will review your sleep and health history. Results: Your test results will be provided to your Physician. If they are positive your Physician may prescribe CPAP Therapy. Treatment: When we receive your Physician’s prescription we will schedule an appointment with you to start CPAP Therapy. You will have frequent contact with us throughout your CPAP Trial to ensure your therapy is optimized. A report of your progress on CPAP Therapy will be sent to your Physician. Ongoing Service & Support: Scheduled annual therapy reviews will occur, and you are welcome to contact us at any time for assistance. Financing Your Therapy: We will help you access Extended Health Benefits and other funding options. Flexible financing is also available. Follow-up Assessments: System maintenance and Physician communication are part of IRS’ commitment to providing exceptional service. CPAP is the most effective nonsurgical treatment for obstructive sleep apnea. It is the first treatment choice and the most widely used. Doctors use CPAP to treat people who have moderate to severe sleep apnea. CPAP is the treatment of choice for people who have sleep apnea and coronary artery disease (CAD) or heart failure. Overall, CPAP is effective for moderate and severe obstructive sleep apnea. Research shows that continuous positive airway pressure (CPAP) decreases daytime sleepiness, especially in those who have moderate to severe sleep apnea. Studies show that in people who have moderate to severe sleep apnea, nasal continuous positive airway pressure (NCPAP) lowers blood pressure during both the day and the night. CPAP is better than other nonsurgical methods for treating obstructive sleep apnea. People with coronary artery disease who use CPAP for sleep apnea are less likely to have heart problems such as heart failure. Dry nose and sore throat. Leaks around the mask because it doesn’t fit properly. Nosebleeds are a rare complication of CPAP. You can expect mild discomfort in the morning when you first start using CPAP. Talk with your healthcare provider and/or doctor if you don’t feel comfortable after a few days. You may be able to limit or stop some of the side effects. If your nose is runny or congested, talk with your doctor about using decongestants or corticosteroid nasal spray medicines. Your Therapist at IRS may be able to adjust your mask to reduce or eliminate problems. Be sure the mask or nasal prongs fit you properly. Air shouldn’t leak around the mask. Your Doctor may be able to adjust your prescription and CPAP settings. Use a humidifier or a corticosteroid nasal spray medicine to reduce nasal irritation and drainage. You may want to talk to your Therapist at IRS and/or doctor about trying other types of CPAP machines. One type of machine will start with a low air pressure and slowly increase the air pressure as you fall asleep. This kind of machine can help reduce discomfort caused by too much constant pressure in your nose. A bilevel positive airway pressure machine (BiPAP) uses a different air pressure when you breathe in than when you breathe out. BiPAP may work better than standard CPAP for treating obstructive sleep apnea in people who have heart failure. You may find BiPAP more comfortable than CPAP because you can breathe out against a lower air pressure. As a result, you may be more likely to continue the treatment. You will have to spend the night at a sleep laboratory to find the air pressure levels that work best for you. An auto-titrating continuous positive airway pressure (APAP) can automatically decrease or increase the air pressure as needed. This may make the machine more comfortable and easier to use. Get Started WIth IRS Today! If you’re a doctor or respiratory specialist and need to refer your patient to us, or if you’re going to see your doctor about respiratory issues, feel free to download our printable Doctor Referral Form by clicking the button below. If you want to get started with our team of respiratory professionals, click the button below and get started with screening for Sleep Apnea. An IRS member will contact you to setup an initial appointment. IRS has access to and provides you with all of the CPAP and respiratory equipment you need for your treatment. Have a look at our extensive equipment directory by clicking the link below. Find An IRS Location Near You To Get The Sleep Apnea Help You Need Today!